Early last summer when we first moved to the farm, we spotted a gopher in our front yard. Gophers around here are big pests. They dig holes in yards and fields and eat our crops. They are prolific. And we shoot them as much as possible. I wasn't sure how the girls would react to this. Could they handle it? I called the girls to the window to show them the gopher. "Awwww, how adorable! ", they sang. Then, without missing a beat, "Kill it, Daddy! Kill it!" I think they can take it. 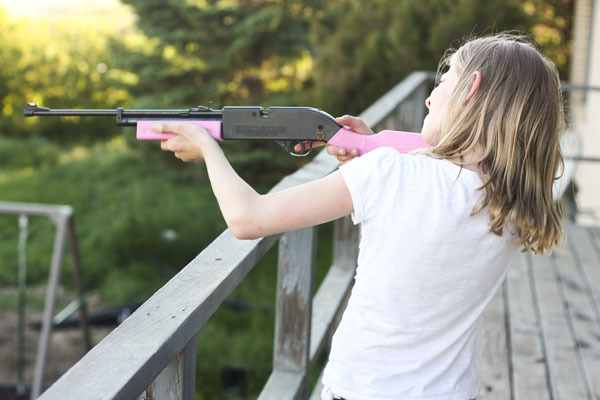 In fact, this summer Abby worked hard to save her money and buy a bee bee/pellet gun. A pink one no less. And she has already killed a few gophers. That's my girl.